Premier Christy Clark promotes the benefits of the Trans-Pacific Partnership at a Victoria seafood shop Wednesday. Premier compares NDP's 'Leap Manifesto' to Donald Trump's campaign against free trade in the U.S.
Apr. 13, 2016 7:00 p.m.
Premier Christy Clark proclaimed her government’s support for the Trans-Pacific Partnership Wednesday with a campaign-style event touting the benefits of removing tariffs on seafood and other B.C. exports. Clark and International Trade Minister Teresa Wat released a letter to federal International Trade Minister Chrystia Freeland supporting the trade deal, signed by 80 B.C. businesses from food producers to aircraft and forest companies. Clark wasted little time setting the political hook for the opposition NDP, whose federal wing debated the anti-trade “Leap Manifesto” at its convention in Alberta last weekend. She compared that to U.S. presidential candidate Donald Trump’s campaign against trade deals. “It’s an argument we’ve seen south of the border, and now it’s an argument that’s contaminated the Canadian political debate as well,” Clark said. The B.C. Liberals then forced debate on a motion to support the TPP in the legislature. 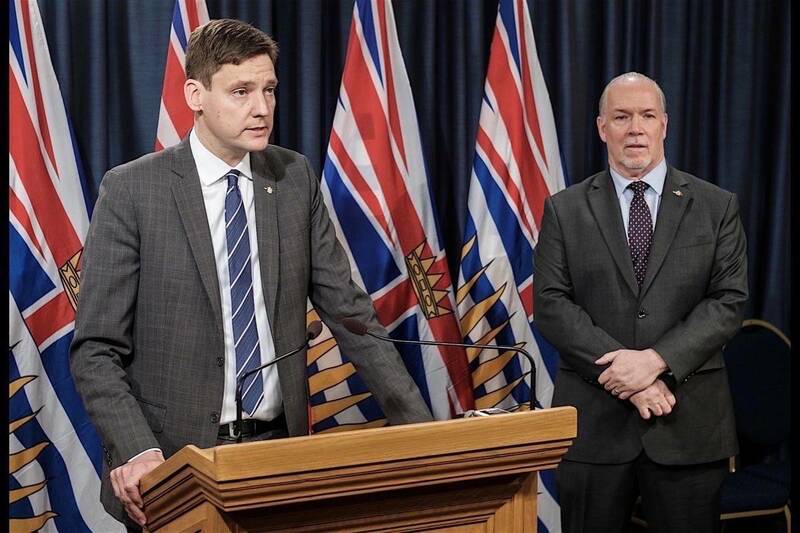 NDP leader John Horgan quoted sources including the CEO of Ford of Canada and a former CEO of Blackberry Canada saying the agreement is bad for the Canadian car and high-tech industries. Horgan noted that federal hearings on the TPP are being held next week. Freeland has signed the agreement on behalf of Canada, but it requires ratification by governments in Canada, the U.S., Mexico, Japan, Australia, New Zealand, Malaysia and other Pacific Rim countries before it takes effect. The B.C. Chamber of Commerce says fish and seafood are currently subject to 15 per cent duty in Japan and Malaysia, up to 34 per cent in Vietnam and up to five per cent in New Zealand. Beef, fresh and frozen vegetables, fresh cherries and fresh and frozen blueberries also face tariffs in Asian countries that would be eliminated by the TPP.